NEW BRITAIN - It’s not too late to register for the city’s annual fishing derby, scheduled for this Saturday at Stanley Quarter Park. 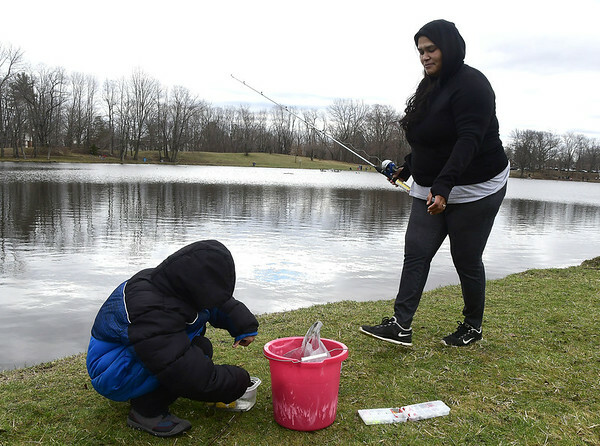 “The fishing derby is an annual tradition in our city that marks the start of spring and the opportunity to enjoy our wonderful parks during the warmer months,” said Mayor Erin Stewart in a statement released on Monday. The event will be held on Saturday, April 13, from 9 a.m. to noon. Participants must supply their own rods, bait and tackle. The department will be stocking the pond with over 200 trout the day before the derby. The department is accepting registrations on a first-come first-serve basis. Registration forms are available in the Parks, Recreation and Community Services Office in room 302, City Hall, located at 27 W. Main St. Mail-in registrations are also accepted. Participants 15 years of age and younger can register for the children’s division. Children registered by Friday, April 12, will receive an additional raffle ticket and a free gift bag (while supplies last) on the day of the derby. Participants who qualify for the children’s division and are not pre-registered by Friday will be required to pay a $1 fee on the day of the Derby. Participants over the age of 16 must register in the adult division and can pre-register for $8 or pay $10 on the day of the event. New this year will be a raffle with three large prizes. First-place prize will be a canoe with paddles, second place is a free membership to the New Britain Museum of American Art, and third place is a free membership to the New Britain Youth Museum and Hungerford Park Nature Center. The four children’s age groups are as follows: under 5 years, 5 to 8 years, 9 to 12 years, and 13 to 15 years. Prizes will be awarded for the heaviest fish, longest fish, and most fish caught in each specific age group. Prizes will be provided by local businesses, clubs and private donors. Children will also have the chance to catch tagged fish. Children who catch a tagged fish will receive a gift card to Cabela’s, the largest sporting goods store in Connecticut. Sponsors for the event include Guida’s Dairy, Vinci’s Catering, Franco-American Art, New Britain Youth Museum and Hungerford Park Nature Center, Precision Scales, Black Hole Video, Veterans of Foreigh Wars, Inc., CSA New Britain, Big Little Bait and Tackle, Jim and Mary Haggerty, Raymond Szajkowski and Alice Kondizacki, Oliver Stewart, Nick and Alaina Sahadi, Dawn Stellmacher-Keller Williams Realtor, and Lighthouse Family Worship Center. “I’d like to encourage our families to come out to Stanley Quarter and create some long-lasting memories during this fun-filled event,” said Stewart. Posted in New Britain Herald, New Britain on Wednesday, 10 April 2019 21:01. Updated: Wednesday, 10 April 2019 21:03.